Spinning a Good Yarn - what goes into spinning our yarn? I’m not sure if you’ve ever asked yourself the question, “When does a yarn become a yarn?” I hadn’t until I had the pleasure of visiting Laxtons as part of my quest to find out more about spinning and how yarn is produced. Laxtons is a fourth-generation textile mill in Yorkshire. It was established in 1907 and has survived and, at times, flourished in the ups and downs of the UK spinning industry for over a century. There’s a great page on their website that details the company’s history. 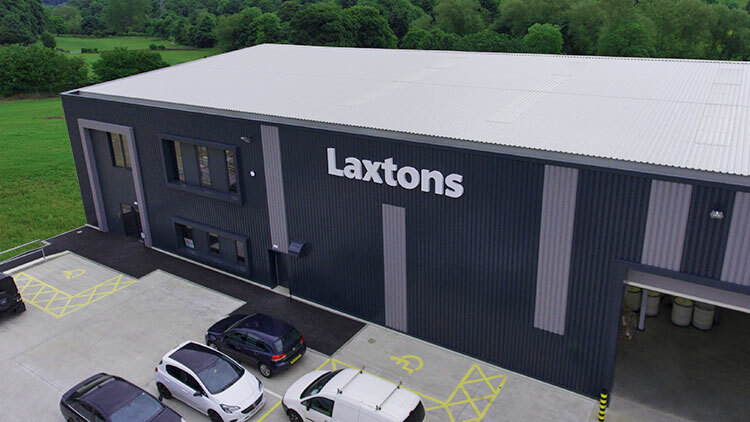 In spring 2017, Laxtons opened a new factory as they had outgrown their previous site. With the new site they have been able to increase their energy efficiency and have invested in some new machinery and technology e.g. electronic steaming, automatic backwinding and low energy lighting to name a few. 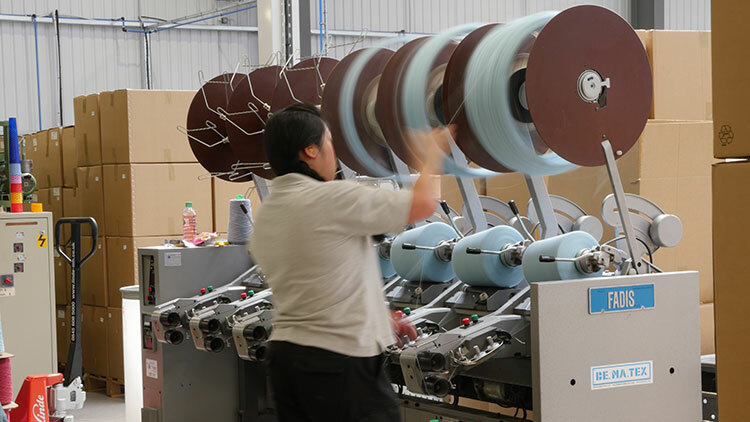 Laxtons spin yarn for hand knitting brands, fashion labels, upholstery manufacturers and carpet & rug makers. They also sell their own brand of machine knitting yarn, Sheepsoft, and a range of undyed yarns for hand-dyers, felters and weavers. Where possible the fibre they use for their own yarns is British. They are conscious of their carbon footprint and purchase from local Yorkshire suppliers who buy from the British Wool Marketing Board. Obviously, for some types of fibre this isn’t possible – their merino is sourced from either South America or South Africa (and so is mulesing-free). I met with Richard Walton, from the sales department, who gave me a tour of the factory and spoke with great enthusiasm and knowledge about the industry, the processes and the yarn that they produce. Depending on the desired resultant yarn count the sliver may then be fed through a machine to further draw the fibre and add slight twist – the output from this part of the process is called Roving. The Sliver or Roving is then transferred to the spinning frame. Spinning is achieved by drafting finer still, feeding it through sets of rollers where the first always slower than the second so that the sliver is drawn out. 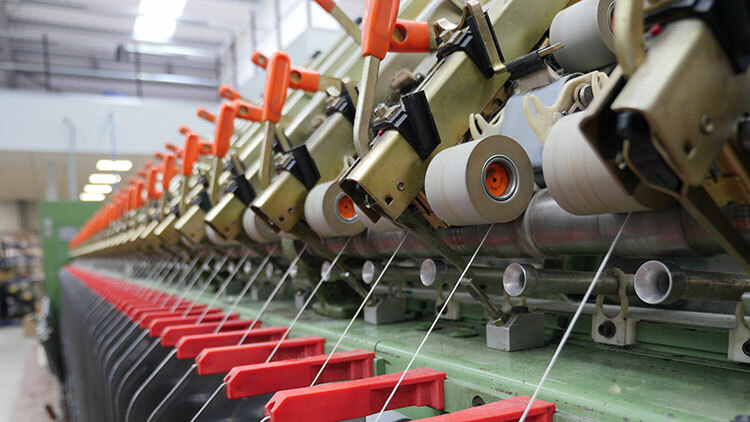 It is then twisted on to a bobbin by a mechanised spindle rotating at high speed, a plastic traveler, through which the fibre is passed, is dragged by centrifugal force around a “steel ring” adding directional twist – hence the term Ring Spun. It is only when this has been done that it can be called ‘yarn’! Once the yarn has been spun, it is back wound from the bobbin onto cones. This winding process includes the detection and removal of any spinning faults, contamination, knots and slubs. Once wound, the yarn is steamed to ‘relax’ the fibres and to set the twist. The single yarn is then plied – the strands are twisted together, in the direction opposite that in which they were spun. The yarn is re-steamed and goes through the finishing process where it is passed through a ‘steam-kettle’ allowing the fibres again to relax and bulk. If it is to be dyed it is wound onto hanks and sent off for dyeing. If the fibre is pre-dyed or is to remain natural, then it is wound into either skeins or balls depending on the customers requirement. During the late 1970’s and 1980’s that much of the UK textile production moved “overseas” and with it we lost British expertise. The UK production started to pick up again in the early 2000s, however, the industry still suffers from this ‘lost generation’ of experts. 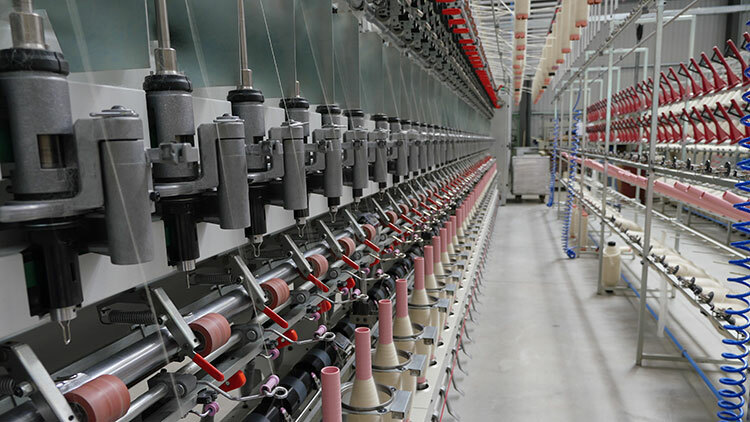 The new factory was the first new spinning facility to be opened in the UK in 40 years. It takes approximately 600kg of fleece to make 285kg of worsted yarn. When you feel yarn that is wound into skeins rather than balls you get a better sense of its texture as your fingertips (as well as palm of your hand) are able to feel it. 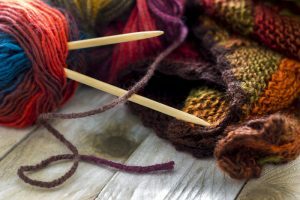 Machine knitting yarns don’t tend to have as much twist as hand knitting yarns so that they pass more easily through the needles and are less likely to knit on the bias. Laxtons spin yarn for many of the UK’s hand-knitting brands including Erika Knight, Debbie Bliss, Toft, Baa Ram Ewe, Wool Couture and Whistlebare. Erika Knight & Debbie Bliss are featured in my blog, How about the big brands? and Whistlebare’s Yeavering Bell is one of my Featured Yarns.